It’s just before boarding; there are a few last minute touches of polish on the brass, one more check of the deck to make sure all the lines are flemished and coiled and at 5 p.m. the first guests start to arrive. We greet them warmly – some first-time passengers, some are repeat passengers who return every year. One returning couple tells us that the trip on the Riggin starts when they get in the car to leave their house; off comes the watch and it doesn’t go back on until they hit the dock after a week on board. Everyone stows their gear in their cabins, then are shown around the deck and galley by one of the crew. They pause to help themselves to hot coffee or tea and homemade cookies then start meeting their fellow passengers and crew. 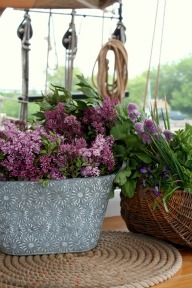 Annie is meeting passengers as she arranges the flowers and herbs she’s just picked from the garden behind their house. A harbor seal pops his head up and eyes us curiously. At 6 p.m. Captain Jon gathers everyone ‘round for “captain’s call” –introducing them to the ins and outs of shipboard living and talking about what to expect for the week. Except for the hottest days of the summer, the wood stove is a welcome source of heat as the air cools; folks gather in the varnished pine galley to read or get to know each other. Too excited to sleep, most everyone’s up early Monday morning. The crew is bucketing down the decks, packing ice and loading wood. A week’s worth of provisions is carefully loaded and packed in ice, and arranged in the order of when they will be used. 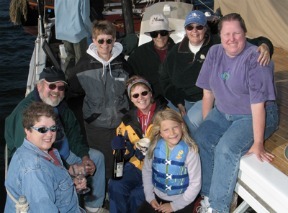 Annie has been up since 4:30 a.m.; coffee is ready and on deck by 7 a.m. After a hearty breakfast of pancakes and bacon, passengers go ashore for any last minute items – foul weather gear, extra film and batteries for their cameras, soda and beer. We aren’t alone – other windjammers are leaving their homeport as well. It’s a majestic sight. As we pass both the Rockland and Owl’s Head Lighthouses and looks south across the sparkling water, all we can see is open space – sky and water. To the north and west are the legendary Camden Hills and all of the splendid islands of Penobscot Bay. The breeze is brisk so we have time to play. 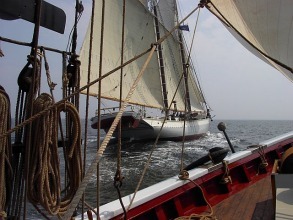 As we race up to Camden to see the boats entering the bay, we’re feeling the wind on our cheeks, the exciting motion of the schooner, and the sound of the waves lapping against the bow. After a magical first day, we ghost into Buck’s Harbor. A talented steel band frequently performs by the General Store and tonight is no exception. After dinner we all go ashore to explore, walk around and listen to the music. 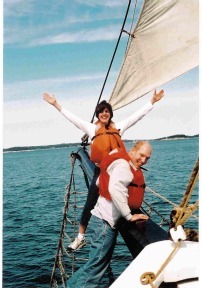 Robert McCloskey wrote about Bucks Harbor in his renowned children’s book One Morning in Maine. He was a two-time Caldecott Medalist — Make Way for Ducklings won in 1942 and Time of Wonder in 1958. He also wrote Blueberries for Sal, our family’s favorite. It’s a sunny morning and this is the warmest harbor we will be in all week long. My girls know it – so they talk me into going swimming with them. This convinces a few adventurous folks to give it a try also. Some are in and out – you almost wonder if they got wet! Others discover that it’s refreshing and stay in to swim around the boat and maybe wash their hair (we have a shower onboard but many passengers still prefer to wash their hair with fresh seawater). While we are swimming, the crew is busy readying the boat for sail. This is the first morning to raise the anchor – it’s all done by hand and is a real team effort! What satisfaction to sail off the anchor under our own power and through the efforts of those on board. It’s one of those meandering days so we turn southwest to head down Eggemoggin Reach. There is a high suspension bridge that connects Little Deer Island to the mainland. We sail under it calling “Ollie, Ollie oxen free!” Once, we saw three deer here — swimming from one island shore to another. Folks settle in fairly quickly today, finding a favorite spot on a cabin top for reading, or on the bowsprit quietly looking out to sea. Many are on the quarterdeck by the wheel, listening to Captain Jon answer questions and tell a few stories. After a leisurely day we find ourselves anchored in Burnt Coat Harbor (on Swan’s Island), a snug and pretty harbor that boasts a historic lighthouse and residents that can trace their family roots on the island back to the Boston Tea Party. Jon pulls out his guitar and soon we’re singing favorite songs of the sea, and of the ships and people that make the ocean their home. Wanting to explore a bit, several of us go ashore and walk out to Burnt Coat Harbor Light on Hockamock Head, admiring wildflowers and seashells on our route. We take pictures and leave the wildflowers and seashells for others to appreciate as well. Singing to raise the sails, the cadence is easy to adopt and the sails go up quickly. 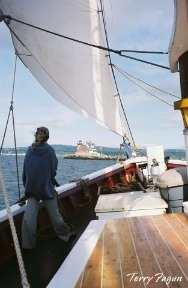 Annie is in the yawl boat Black Beauty pushing the schooner out of the harbor. Capt. Jon built her a few winters back out of local oak, brown heart and silver baly. She is our tugboat and our launch; she helps us get where we need to go when we don’t have enough wind and ferries us ashore for walks and shopping. Wednesdays are one of our favorite days of the week. It is on this day that shoulders relax, laughter is easy, conversations meaningful, and even moments of silence are noted and appreciated. There is a simpler appreciation of our surroundings. 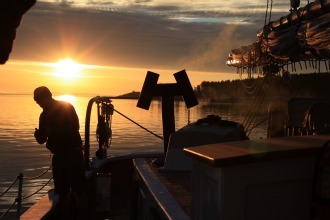 This day is the turning point as the magic and slower tempo of being on Penobscot Bay really seeps in and the hectic pace of our lives on shore falls away. By late afternoon we’ve dropped the “hook” (anchor) in Stonington. Lobster boats cluster around the harbor and houses seem to protect the hill. This is a true lobstering village. From the deck we can see one building painted with huge letters, spelling out “Opera House”. It’s nearly time for dinner; but there’ll be plenty of time to go ashore tomorrow. After smelling dinner all afternoon long, we finally get a taste. All hands sit in a galley made cozy by the light of kerosene lanterns and fresh flowers on the table. It’s early morning yet, but excitement starts to build as Cap’n Jon returns from an early trip with a crate full of fresh lobsters. After breakfast Pearl ferries us ashore to Stonington. Stonington, on the southern tip of Deer Isle, is aptly named. There is abundant evidence in town and on the surrounding islands of granite quarries, a mainstay for the town in the 19th century. Nowadays the residents of Stonington earn a living from lobstering and a few craft shops. The oldest kids we know, and a magical couple, Jan & Evelyn Kok have been welcoming and entertaining windjammer passengers for decades in their tiny, eclectic shop, the Gallery of the Purple Fish, in Stonington. 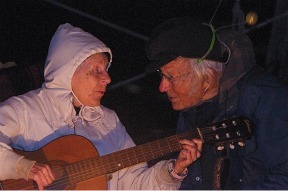 Both are artists – Jan a music director and Evelyn an illustrator. Their shop is full of fascinating artwork and knick-knacks. Very little of it is for sale, but Evelyn makes beautiful bookmarks featuring all the schooners as well as a number of beautiful line drawings. It’s wonderful to poke around while Evelyn hand-letters passengers’ names on the bookmarks and it’s not at all unusual for Jan & Evelyn to break into one of their songs – it feels like you’ve walked into a pixie’s tea party. After a leisurely morning ashore we weigh anchor, raise sails, and we’re off, cruising among the islands of Merchant’s Row. We see a school of porpoise appear among the waves – cameras and binoculars are quickly pulled out. We anchor early near the sandy beach of Lindy Cove for our lobster bake. There’s no rush as we have plenty of time to explore the island before we settle down to all the lobster we can eat. The last boatload returns to the Riggin at dusk. We got a little extra sun today and everyone is happy and full. We watch as the stars come out, and have an impromptu star-gazing session, pointing out the Big and Little Dipper, Cassiopeia and the Summer Triangle. As the week goes by everyone relaxes more and more and rises later and later. But coffee is still ready at 7 a.m. for early risers, and several passengers take our pea pod out for a quiet row. By Friday everyone is an ol’ salt and is ready help get the Riggin underway; the Captain calls out “Heave out!” and “Raise your headsails!” and we’re off for our final full day of sailing. We head westward, back towards Rockland. Sailing off the anchor powered by wind alone. No sound of an engine, no smell of diesel fumes, just the water lapping on the hull. With a brisk wind, we sail through the Fox Islands Thoroughfare, a picturesque passageway between Vinalhaven and North Haven Islands and then tack out to the east side. We turn north and, as the afternoon sea breeze fills our sails, shoot up the coast of North Haven to our final stop for the trip, Pulpit Harbor. Records of the osprey nest that stands as a sentry at the entrance of Pulpit Harbor on the island of North Haven go back over 200 years. It’s a real treat to sit at anchor and watch these majestic birds fish for their dinners. It’s been an exciting week! Saturday morning we raise anchor early and head back home. Last minute group photos are taken, addresses exchanged, and a hearty brunch is served to tide everyone over on their way home. We tie up in Rockland amid relaxed, revitalized smiles and see everyone ashore hugs and goodbyes. 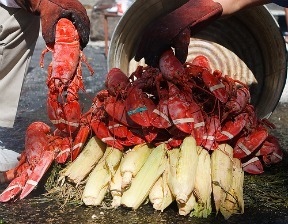 The highlight of the week for many of our passengers is our traditional Maine lobster bake. It’s an all-you-can-eat feast; seven whole lobsters eaten by one person, a girl scout!, in one sitting is the record (please do not try this at home). After anchoring near an undisturbed island in the early afternoon, the yawl boat ferries us ashore and we hop across the granite rocks to the beach. Everyone wanders off in a different directions – exploring inland, walking the shore, swimming- some even help set up for dinner. A fire is lit below the high tide mark, corn is shucked, various goodies are put out to tide us over until the lobster is ready. Once the fire is really going the lobster pot- a huge steel tub- is filled with 2-3 inches of salt water and set on the fire to boil. While we wait for the water to boil, several armloads of seaweed are gathered (we are careful to leave some seaweed at each spot so it can grow back). Once the water is boiling we layer the lobsters, corn, mussels and clams in the pot, cover it with a “lid” of seaweed, wait for it to come to a boil and rotate the pot for even cooking on the fire. When the water comes to a second boil we’ll pull some of the seaweed aside and check to see that the lobsters are red all over. When they are done, the pot is carried away from the fire, the seaweed is arranged on a flat rock and everything is placed on the seaweed bed, ready to eat (the crew does the lobster dance). 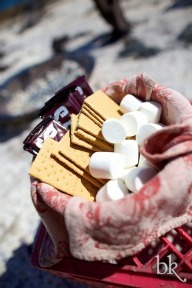 Once everyone has had their fill of lobster, the watermelon is sliced and the makings for S’mores are laid out. There’s always a lively discussion over how to make the best S ‘more, and the proper way to roast a marshmallow – golden on the outside and soft and gooey inside or burnt to a crisp on the outside and just warmed on the inside.